North of the popular West Fork tributary, Oak Creek flows another 3 miles before branching again, at the point where AZ 89A starts its steep climb up the canyon walls towards Flagstaff; the west branch (Sterling Canyon) is fairly short and not too interesting but the east branch remains deep and enclosed for several miles. 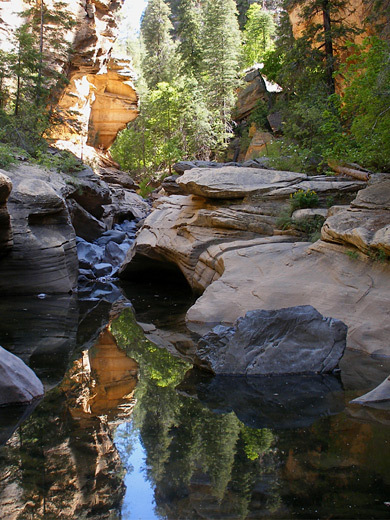 This is Pumphouse Wash, a beautiful, sheer-walled gorge through cream-colored Coconino sandstone, containing deep pools, small cascades and flooded slot-like channels. Faint traffic noise from AZ 89A high above is audible at some times but otherwise the canyon is quite unspoilt and not much visited, despite the proximity to the highway, partly as there is no trail or signpost, and only limited parking where the road crosses the lower end of the canyon. 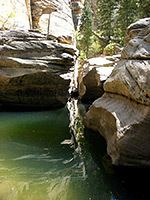 A tributary (James Canyon) also has narrows, plus pools and drop offs that make ropes necessary in a few places, so exploration is best in the downstream direction, but Pumphouse Wash can be followed upstream from the highway quite easily; the hike involves hopping over boulders, wading a few pools and walking on benches to avoid some of the deeper channels. 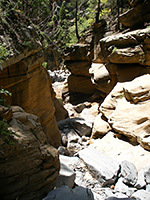 The canyon is best avoided during the spring snowmelt, however, and has moderate flash flood danger in the summer monsoon season. 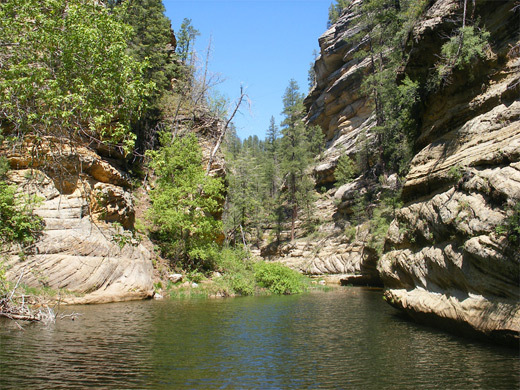 The scenery is comparable to the lower reaches of nearby West Fork of Oak Creek though subtly different, as the rocks are yellow-brown rather than red, the surroundings are generally less wooded, and Pumphouse Wash has a greater variety of pools and eroded rock formations. Topographic map of Pumphouse Wash.
20 views of Pumphouse Wash; gallery, slideshow. Panorama of the narrows. Full screen version (18 mb). Scenes in the canyon (mp4; 1:34 min; 18.2 mb). The closest parking for the Pumphouse Wash hike is at a narrow pullout on the west side of AZ 89A immediately south of the road bridge over the canyon, shortly before the highway begins the 850 foot climb to the plateau rim - this location is 13 miles north of Sedona and 16 miles south of Flagstaff. Like most of Oak Creek, the valley at this point is cool, forested and shady, and holds a permanent stream, originating from a spring just upcanyon. All parked vehicles along the highway need to display a USFS Red Rock Pass, which are not available from the staffed West Fork trailhead 3 miles south; instead the nearest purchase locations are the ranger cabin at Oak Creek Vista 3 miles north (not always open), or at the self-service machine at Encinoso Picnic Area, 8 miles south. Pumphouse Wash is reached by walking down from the parking area to Oak Creek, upstream a short distance, past some pools, to the Sterling Canyon junction, then turning right, underneath the highway bridge. The lower end of the gorge is typically about 50 feet across at stream level, filled with big grey-white boulders kept largely free of vegetation by occasional flash floods, and is already quite deep, bordered by sheer cliffs in some places and steeply-sloping rocks in others. The gorge constricts after a few bends, to the first of several places where water covers all the streambed; a dark, cold pool usually several feet deep that can either be waded, or bypassed by scrambling up the overgrown hillside to the right. 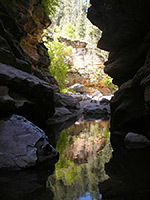 A second, similar sized but shallower pool is found a little way beyond, as the scenery becomes gradually more impressive - a narrower canyon, taller cliffs and many more pools along the creekbed, now within potholes and short slots rather than all across the canyon. 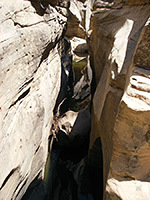 The best section starts upstream of a sandstone wall across the drainage; the watercourse emerges from a short twisting slot then soon after enters a series of deep pools and narrow submerged channels up to 50 feet deep holding dark, cold, reflective water and enclosed by light colored sandstone containing thin horizontal bands of darker rock. Above, the cliff faces of the main gorge are mostly old, grey and weathered but light brown where recent rock falls have occurred. Tall Douglas fir trees grow on the rim and in a few places lower down; either side of the watery channels are level benches covered with bushes and wildflowers, while further upstream the canyon becomes rather more overgrown. Next are a series of shallower pools and gently sloping terraces, as James Canyon joins from the east, followed soon after by the largest pool in the whole canyon, maybe ten feet deep and 250 feet long, ending beneath a 14 foot dryfall. This pool is about 3 miles from the trailhead. There are no more narrows above here; another tributary (Kelly Canyon) joins from the east after another 1.3 miles by which time the main drainage is rather less deep and starts to gain height steadily.